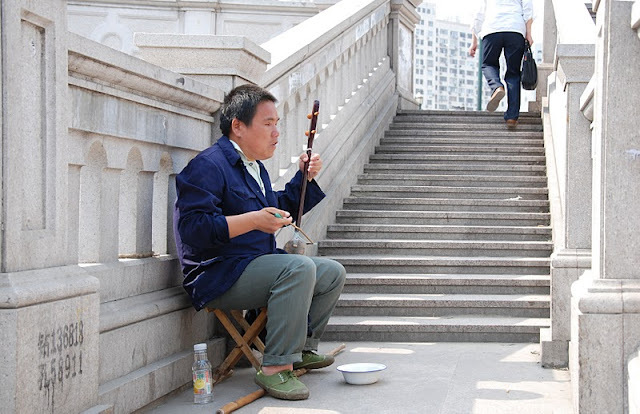 A photo of a busker playing the gehu on a stairwell of the Xizang Bridge. In contrast to most countries, there are very few panhandlers or street musicians in China. I don't know if this is because there are fewer poor people or because such activities are frowned upon. In the United States, the underside of bridges and especially seat-type abutments are used as shelters by poor and homeless people. This usually is not a problem. When a bridge engineer needs to inspect a bridge, the residents are usually willing to temporarily move out of the way. In folk tales, a villain, a troll, or even a monster might live under a bridge and prey upon unwitting travelers. This may have been a more successful occupation before people began traveling in fast-moving metal vehicles on well-maintained highways. Shanghai, China's Bridges: Xizang Road Bridge (2) by Mark Yashinsky is licensed under a Creative Commons Attribution-NonCommercial-ShareAlike 3.0 United States License.